Run thousands of Windows apps like Microsoft Office, Internet Explorer, Access, Quicken, QuickBooks, Visual Studio, even graphic intensive games and CAD programs without compromising on performance or rebooting. Ready and optimized for the highly anticipated release of macOS Mojave (10.14) and Windows 10 updates. Be ready for Dark Mode, as well as security and privacy feature updates. Plus, from your Windows applications, seamlessly experience Quick Look and Continuity Camera with your iPhone. 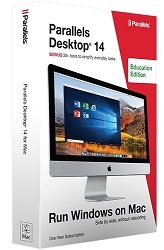 Parallels Desktop 14® for Mac makes it easier than ever to get back space on your Mac! Get up to 20 GB back with new disk usage optimization. Automatically reorganize your virtual disk to increase limits for optimal storage savings. The "Free up Disk Space" notifications display how to archive data and reclaim space—plus, you can utilize Clean Drive in Parallels Toolbox to save even more space. Stay up to date with changes to video memory allocation and improved OpenGL support. Launch even more applications and popular CAD programs without slowing down your Mac. Run SketchUp Pro, OriginLab, DIALux 8, DELFTship, CTvox, and more on your Mac with Parallels Desktop 14. Get additional support with the Mac Touch Bar™ for Windows and Windows applications such as AutoCAD, Revit, SketchUp, Visual Studio, OneNote, and Visio. Plus, continue to use the Touch Bar Wizard (introduced in Parallels Desktop 13) for advanced customization options. Quickly view, track, and manage your CPU usage in the status bar while using Window and Full Screen modes. New Resource Monitor simplifies how you view CPU and RAM availability.